This week our baby gets toes, fingers, and starts to move around! Matt and I stay amazed at the creation of life! How God can take two imperfect people and create such intricate perfection! We had our first glimpse of this little life on Friday! 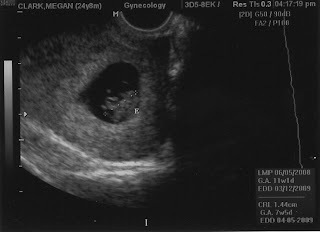 We sat mesmerized by the flickering black and white image on the screen as we saw our baby and its little heart beat. It was so fast! We were both speechless and of course had smiles etched across our faces! We couldn't even see details, but it was the cutest baby you've ever seen! And you know we had to call the grandparents right away to tell them how cute and perfect the baby is! As of Friday August, 22, our baby was 1.44 cm long, the size of a large blueberry! And this week the baby will grow to over 1/2 long! So more points to my incredible husband! He has gone out two late nights in a row to satisfy my craving for Wendy's Frosty! It's about the only thing my stomach calls friend right now, and just perfect. Matt makes no complaint as he drives across town to fetch my craving. He has even done the grocery shopping, made his own meals, bought me breakfast in bed (when I can tolerate it:)), washed the dishes, and taken out trash! He worked non-stop this weekend with no complaints and I could not feel more blessed to have such an amazing husband. I can't wait until our baby gets to know its incredible Dad!